Flashback to March 7, 2015. The UND men's hockey team gritted out a 2-1 win on Friday night over Miami in their home barn to clinch the Penrose Cup as National Collegiate Hockey Conference champions. The Green and White were presented the Penrose in the locker room, but the celebration bled out to the ice as the team posed for pictures with the regular season championship trophy. I'm not sure how you'd feel about that, but if DDC were in the Miami home locker room, that would certainly leave him with a sour taste in his mouth. Although the stakes may not be as high, will a bit of revenge be looked for this weekend as the Miami University RedHawks travel to Ralph Engelstad Arena to take on UND in a NCHC series? Here's what to watch for in this conference showdown this Friday and Saturday in DDC's weekly "Who? What? How?" series preview. Fr. 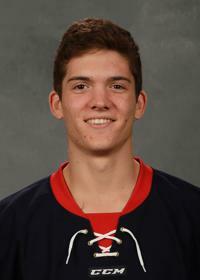 F, Jack Roslovic, 6 goals, 3 assists -- 9 points; Fr. F, Josh Melnick, 3g, 3a -- 6 pts; Jr. F, Anthony Lewis, 1g, 5a -- 6 pts; So. D, Louie Belpedio, 1a, 4a -- 5 pts; Sr. F, Sean Kuraly, 0g, 3a -- 3 pts; Sr. G, Ryan McKay, 5-2-1, 1.70 goals against average (10th in NCAA), .937 save percentage (11th in NCAA). Sr. F, Drake Caggiula, 3g, 8a -- 11 pts; Sr. F, Bryn Chyzyk, 5g, 3a -- 8 pts; Fr. F, Brock Boeser, 5g, 2a -- 7 pts; Jr. D, Troy Stecher, 2g, 5a -- 7 pts; So. F, Nick Schmaltz, 0g, 7a -- 7 pts; Jr. G, Matt Hrynkiw, 1.63 GAA (8th in NCAA), .933 SV PCT (14th in NCAA). North Dakota leads the country in shots on goal with 375, is fourth in shots per game, averaging 37.5 and is second in plus/minus with a +16. UND's 1.70 goals allowed per game is 6th best in the NCAA. Miami ranks 20th with 2.50 allowed. Miami carries the third best penalty kill in the country into this weekend's series, having stopped 34 of 35 power play chances for a sterling 97.1% kill average. UND is 7-4-1 all time against Miami. The two teams split both series last season. No. 3 UND (7-1-2, 2-0-0-0 NCHC) dropped its first game of the year 3-1 last Friday at home against Wisconsin, but battled back and earned a non-conference split with a 3-1 win on Saturday. Friday night's loss haulted the Green and White's best season-opening unbeaten streak (8 games) since 1999-00. No. 17 Miami (5-4-1, 2-2-0-0 NCHC) swept Western Michigan with a pair of 2-1 NCHC victories last weekend at home in Oxford, Ohio. 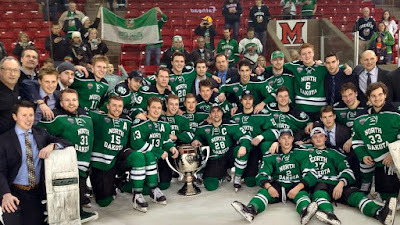 UND celebrated with the Penrose Cup on Miami's home ice last March. UND has certainly had a great start to this season. All things considered, with a new head coach, 11 freshmen and a boatload of injuries, the Green and White have thus far exceeded expectations with a 7-1-2 start. With all due respect to Lake Superior State, Maine, Vermont, Colorado College and Wisconsin, this will be the toughest test for UND to this point in the season. The RedHawks are loaded up front and freshman Jack Roslovic looks to be the real deal. Senior goaltender Ryan McKay has taken control of the Miami net in a battle with fellow senior Jay Williams with solid numbers. UND experienced defeat for the first time this season at the hands of bitter rival Wisconsin last weekend and frankly, they deserved to lose on Friday night. The Badgers were tenacious defensively and had a compete level that the Green and White never really matched. UND bounced back on Saturday with a much better showing and got a convincing win. This will serve this team well as Miami will be jazzed up in front of a raucous REA crowd and will be looking for a bit of payback for the Penrose Cup victory celebration in Oxford. This series screams split, but DDC really likes how UND responded last Saturday against Wisconsin. This team, loaded with freshmen, found out the hard way on Friday night what happens when your compete level isn't where it should be from the drop of the puck. While Miami is very talented, DDC likes the home ice advantage in this one. There you have it. Come back after the series to see if DDC made the right call. Thanks for reading.